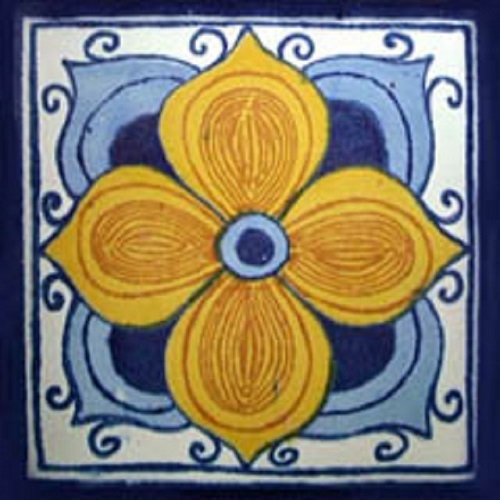 Quite symmetrical, that almost looks like made by a scientist, this Mexican tile “Arabic Flower” brings reminiscence from the Moorish architecture back in Middle Age Spain. The colonial style with blue and yellow ceramic tile design over a white background with a cobalt frame, can be installed in kitchens and bathrooms of all kind of styles with predominant blue and white colors. It is a representative Mexican design but at the same time original. Good design, perfect combination of colors, you all helped me to finish a project that was needing just this final touch, the colors are very solid, the design is well defined , the quality is very high. thank you very much. Mexican Tile "Sky Blue Cross"